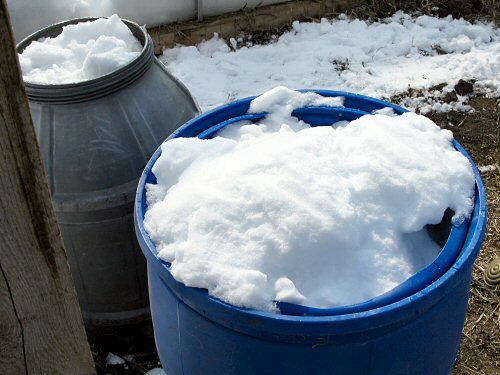 As far as winter irrigation in the greenhouse goes, melting snow in big barrels is the next best thing to a really long hose, a well and an electric pump. 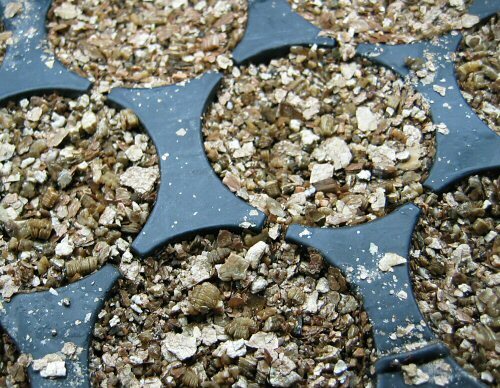 Fill ’em up, cover with clear plastic, wait a day (even on a dull, cloudy day, it gets up to 60°F in the hoophouse). Repeat a couple of times, and you have 50 gallons of rainwater in a barrel! The alternative is dragging 200′ of hose through deep snow from the barn to the greenhouse, then reeling it in and draining it, every couple of days. The weather has put the kibosh on the early-March, barely heated greenhouse plan, the happy prospect until March actually came around. The nights have been regularly plunging to 10°F (-12°C), so it’s really not worthwhile to heat things up by 25°F. No worries. Adjusting expectations and schedules more or less by the day is all part of the fun… It’s never boring! So sensible using the snow, the hoses are also far more difficult to use in the cold as they will have stiffened. I just wanted to say I really enjoy your blog and have added a link to it on my blog. :) I hope that is ok with you. Hey – we have that same blue cistern in our back yard! We drilled a hole at the bottom to add a spigot so we can spread it out with a hose. Just stumble on your blog. Love it! I’m doing the same thing. Although I’m beginning to think hauling buckets of snow into the greenhouse is just as hard as hauling out hoses would be. But it works. And my plants don’t seem to mind. Looks like it finally might be hinting at spring here. 40F and sun this weekend! Anne: Your babies look great! Just about every baby farm animal I’ve seen is incredibly cute, but goats are particularly cool, they’re so…miniature-looking and totally feisty and nimble once they get going.